I was stuck for a long time on this theme. I started off doing fish prints with mono-printing and thickened dyes. Although the results were interesting, I felt that they did not interpret the theme well enough. 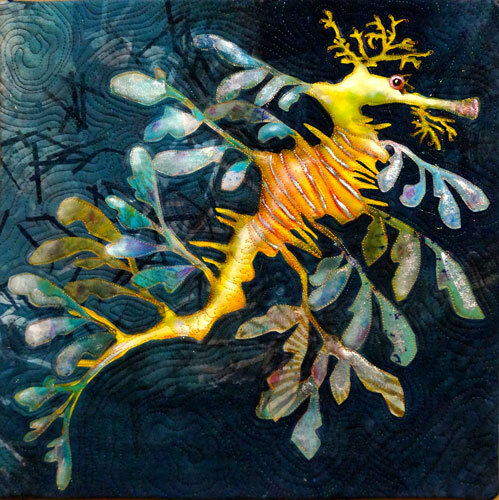 Keeping with the sea theme, I remembered seeing the sea dragons at the Melbourne Aquarium. These little creatures were both ‘in the wild’ and looked ‘wild’. A much better choice. I guess I chose my ‘go to’ technique- raw edge applique to interpret the subject due to time restrictions. 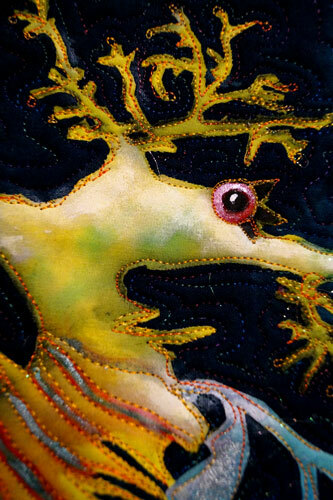 I could have employed many other different techniques, such as printing, reverse applique, etc. which would have been more experimental. The background fabric is fairly muted, as I wanted the main subject to stand out. I used an old piece of cotton that I silk screened with thickened dye and paper shreds. I was in two minds as to the choice of colours. In my mind’s eye I saw bold, mardi gra type colours, but I could not bring myself to deviate from the original colours too much. My intention was then to get as much luminosity happening as possible. In most of my pieces I like to let the fabric do most of the work. I chose an almost fluoro hand dyed yellow cotton for the main body, and then drew in the stripes with a combination of Inktense pencils and metallic paint. I am always careful not to overdo these effects. The leafy parts were cut from deconstructed fabrics and punched up with the media. I used Tsukineko all- purpose Inks for the shading and highlights. I chose my new favourite polyester variegated thread- ‘Rainbows’, by Superior to both quilt and sew down the edges in one go. The same colour was used for the whole figure, to add some unity and I think the orange complements the blue/green leafy fin things well. To keep it subdued, the background was then free motioned quilted with a matching colour. I used a contour type quilting to imitate water. I trapped a few Angelina fibres in the quilting for light to catch now and then. I’ve never used this stuff before as I think it can look tacky! It does not really show up on the photo. As I did not want to add anything to the edge, I used a facing to finish off the piece. I think I need to find some other interesting ways of finishing off edges. I could have perhaps added some beads or sequins along the quilting or even in the dragon’s hair do to add some more pizazz.